Four years ago, if you Googled “Port Covington” few results would appear. 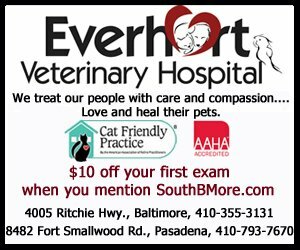 From its failed past, which SouthBMore.com covered in 2012, to today, a lot has changed at this area located on the southern point of the South Baltimore peninsula. It is now one of the most talked about topics in Baltimore and is described as “one of the largest urban renewal projects in America.” Led by Under Armour Founder and CEO Kevin Plank’s Sagamore Development, the project has a 266-acre master plan, which includes a 50-acre campus for Under Armour, and approval for $660 million in Tax Increment Financing (TIF) Bonds for infrastructure, parks, and ecology improvements. Port Covington was originally the home to Fort Covington, used to defend Baltimore during the War of 1812, and later became a depot for the Western Maryland railroad where it was used to ship coal from Ohio, Pennsylvania, and West Virginia off its piers. The site of Sagamore Spirit, an under-construction facility for a new rye whiskey company, was also once the site of a former distillery. Adjacent to South Baltimore peninsula neighborhoods of South Baltimore, Riverside, Locust Point, and Federal Hill, all of which have seen continued investment over the last couple decades, Port Covington was often a head-scratcher for locals because of its lack of investment. This was highlighted by the failed Port Covington Shopping Center. The shopping center included a Walmart; a boarded up Sam’s Club, which opened in 2002 and closed in 2007; parking lots filled with grass; and stop signs with no reason to stop. 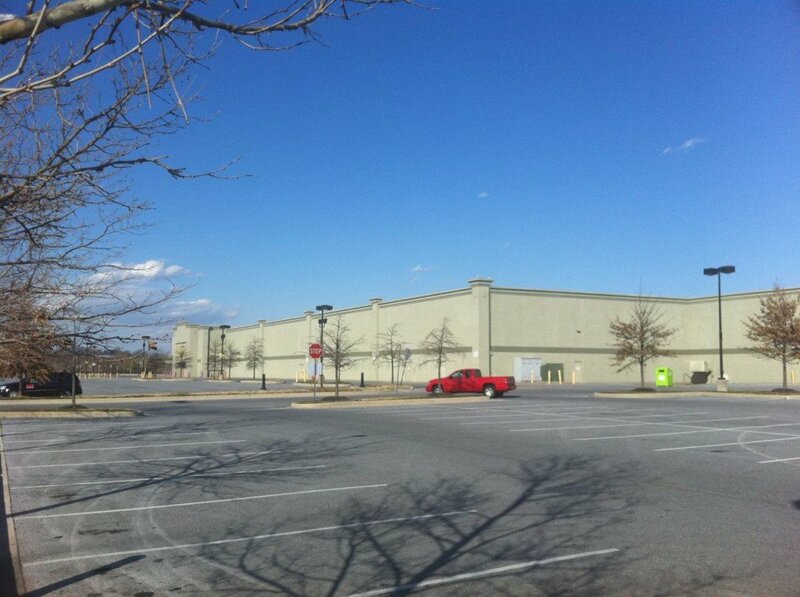 The planned $50 million shopping center was supposed to have restaurants and stores like Home Depot and Staples, but none ever joined Walmart or Sam’s Club. The waterfront section was also eyed for a casino and possibly cruise ships. What went wrong? 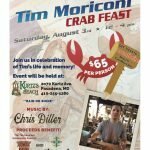 According to a former manager in the planning and building of Port Covington who spoke with SouthBMore.com in 2012, the developers and Walmart Stores Inc. were hoping to get large signage visible from I-95. They were also willing to build an exit off of I-95 and the city said no to both. Seen as a shopping center that would be hard to find and hard to get to, businesses began to withdraw from the plan. Regarding integrating gambling into Port Covington, Maryland’s gaming law was not passed until 2007. The investors had already given up on the idea for a casino and the shopping center was already deemed a failure. In 2008, Streuver Bros. Eccles & Rouse pitched 2 million sq. ft. of residential, retail, and office space adjacent to the shopping center at 301 E. Cromwell St. The pitch included 80,000 sq. ft. of retail space, 64,000 sq. ft. of office space, and 2,010 residential units. Those hopes were dashed as Streuver Bros. shut its doors in 2009. That site went to foreclosure and to auction in 2012, becoming Sagamore’s first acquisition in Port Covington. It will become the site of Sagamore Spirit. In 2008, Under Armour also attempted to move to Port Covington in the West Covington area, a section west of Hanover St., but was unsuccessful. One glimmer of success for Port Covington, albeit one that was eight years in the making, was the opening of West Covington Park in 2015. The former brownfield was transformed by the National Aquarium. 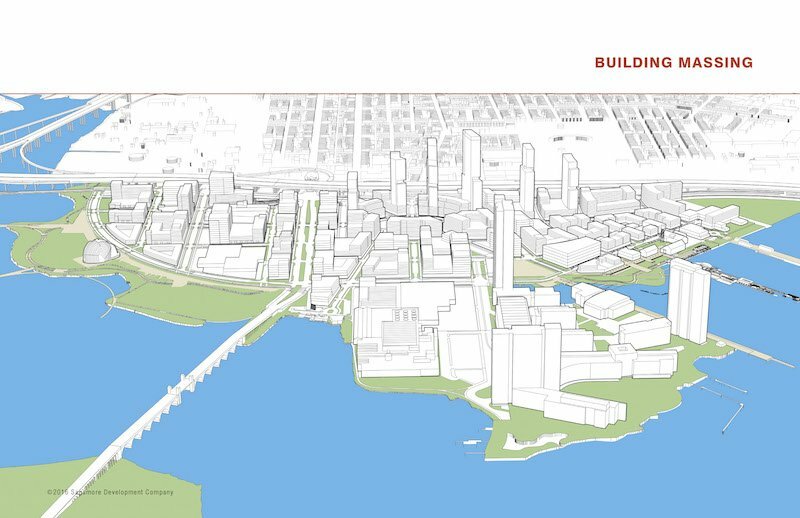 Existing businesses at Port Covington include NGK-Locke, Allied Waste Services, Atlantic Forest Products, Schuster Concrete, The Baltimore Sun printing facility, Nick’s Fish House, Tidewater Yacht Service, TE SubComm, Downtown Dog Resort, and a power plant for BGE. Port Covington is also the home to Swann Park. In 2011, Under Armour looked at developing a new campus on Key Hwy. near Federal Hill. 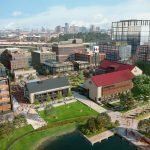 This would have included a partnership with Baltimore Museum of Industry (BMI), however the BMI board voted down the plan and at that time Plank began eyeing a larger vision at Port Covington. Following the acquisition of 301 E. Cromwell St., Sagamore purchased the 59-acre former shopping center for $35 million in early 2014, and in late-2014 it purchased Tribune Media Company’s 60-acre site for $46.5 million. 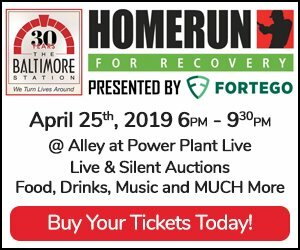 This site includes The Baltimore Sun printing facility which continues to have a long term lease on a portion of the site. 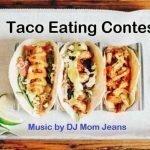 Sagamore also purchased Nick’s Fish House, and leased it to a team that includes the owners of The Starboard in Dewey Beach, Delaware. Sagamore now currently owns 161 acres of land in Port Covington, which the Sagamore team described as 85% of the private parcels in the area, from recent real estate acquisitions totaling $114 million. The majority of the remaining land is comprised of public right-of-ways, parcels controlled by the City and State, and parcels which are owned by CSX according to the Department of Assessments and Taxation of the State records. Sagamore does not own the 26-acre NGK-Locke, Inc. facility. 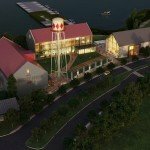 What Did Residents Want for Port Covington? 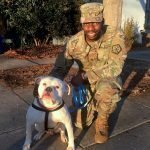 After news of a new owner for the Port Covington shopping center, SouthBMore.com asked readers what they would like see come to the area. The desire for better shopping options in the area was very evident from the poll results. 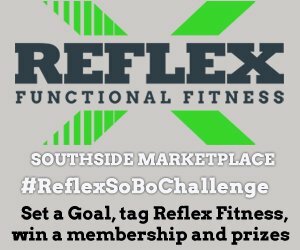 In a dead heat, ‘Mixed-use with shopping, office, and residential’ edged out ‘A more upscale shopping center’ by one vote, with the two combining for 64% of the votes. Next was ‘An entertainment destination’ at 11% and the rest all fell below 10%. ‘A corporate headquarters’ received the least amount of votes at 5%, and ‘Finish the current shopping center’ was next to last with just 7% of the vote. Readers expressed an interest for stores like Trader Joe’s, Fresh Market, Wegmans, Kohl’s, Target, a movie theater, and numerous mentions of Home Depot. 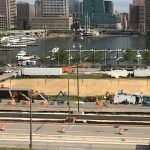 There were also many mentions of utilizing the waterfront as park space, building new athletic fields, and several mentions of space for a new soccer stadium for the DC United or a minor league team. There was also mention of a new high school for the area. A lot of responses expressed the desire to see a combination of many things, as evident with ‘Mixed-Use’ leading the poll results. As it turns out, and as detailed below, most of the options in the poll will be a part of the new Port Covington. Before developing and presenting a greater vision for Port Covington, Sagamore began work at Port Covington. It began by converting 101 W. Dickman St., a former Baltimore City garage, into City Garage. Described as a hub for manufacturing, the 133,000 sq. ft. City Garage is now open and home to Treason Toting Co., The Foundery, Under Armour Lighthouse, Bustin Boards, Hungry Harvest, Sagamore Spirit, Social Leagues, Tapologie, and Workbench. There is also a large event space. It opened in late 2015. Another improvement was the Sagamore Spirit distillery. Inspired by the limestone filtered spring at Kevin Plank’s Sagamore Farm for thoroughbreds in Glyndon, described as perfect for distilling rye whiskey, Plank started Sagamore Spirit and eyed 301. E. Cromwell St. as the site to distill it at. Plans were first presented in March 2015 and construction began the following August. The design includes many elements from Sagamore Farm including red roofs and gray brick, modeled after the horse stables. It is expected to open in the first quarter of 2017. 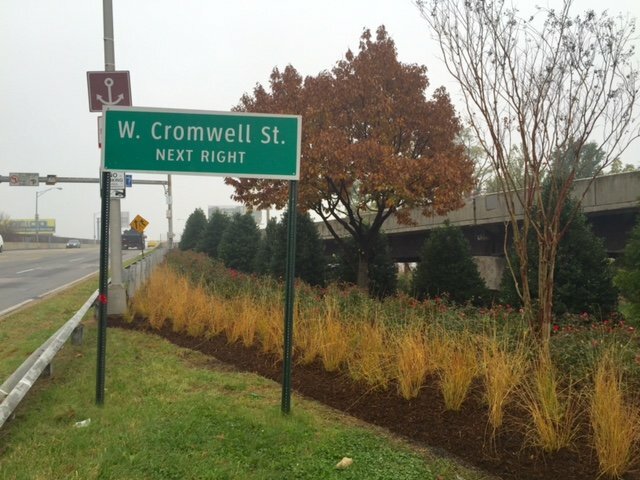 In 2015, Sagamore also began landscaping improvements throughout Port Covington on medians, corners, and adjacent to sidewalks. Sagamore added many new trees, flowers, bushes, and mulch to the area, spots Sagamore has continued to maintain. A new mural was also recently completed on a 360 ft. long wall to the west of Hanover St. and adjacent to W. Dickman St. in Port Covington by local artists Billy Mode and Richard Best. Under Armour opened Building 37 in January, converting the former Sam’s Club into a 170,000 sq. ft. office building for its finance and IT department. The building features an auditorium, café, fitness center, and basketball court. 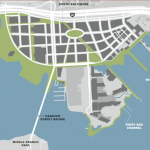 The busy year for Port Covington began in January as Sagamore revealed its 266-acre, $5.5 billion Master Plan to the Baltimore City Planning Department’s Urban Design & Architecture Review Panel (UDARP) for the first time. Sagamore presented before the Planning Department nine additional times, delving into details of the plan during those meetings. Teaming up with Sagamore on the plan is Elkus Manfredi Architects, STV, Biohabitats, and Landworks Studio. 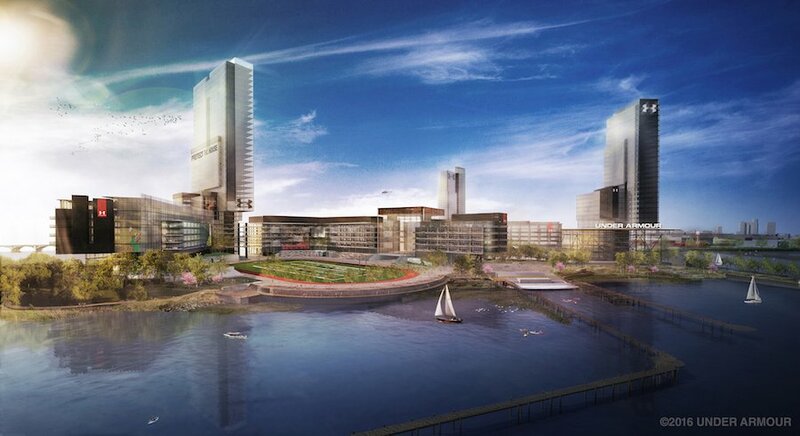 Sagamore’s plan for Port Covington includes Under Armour’s 50-acre, 3.9 million sq. ft. global headquarters at the former Port Covington Shopping Center; 1,500,000 sq. ft. of destination, attraction, entertainment, and specialty retail; 500,000 sq. ft. of “maker” and industrial/light manufacturing space; 200-plus hotel rooms; 1,500,000 sq. ft. of office space (in addition to the Under Armour Global Headquarters); and civic and cultural uses including 40-plus acres of public parks, a public waterfront, and other public facilities. 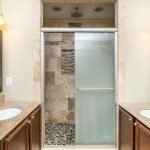 It also includes more than 7,500 residential units, which could total up to 14,000 units comprised of rental and for-sale properties at various price-points. The plan also includes potential sites for a post office, school, library, fire station, police paddock, and cultural center. Plank called Port Covington, which is highly visible from I-95, “Baltimore’s front porch” because of the 200,000 cars that pass by each day. “We are going to make this front porch as fine as any destination in the world,” he said. Sagamore projects the project will create 23,994 temporary jobs that will provide an annual compensation of $1,920,367,864. The project is also projected to create 34,974 permanent jobs with an estimated annual compensation of $2,377,516,522. This is broken down as 6,801 retail jobs, 27,825 office jobs, 125 hotel jobs, and 223 manufacturing jobs. The project is expected to take more than 20 years. 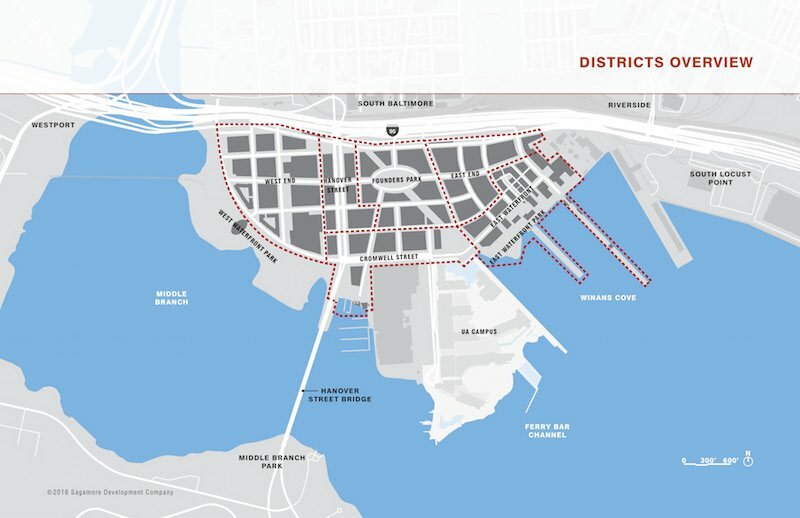 Many new districts will be created in Port Covington. These include West End, Hanover Street, Cromwell Street, Founders Park, East End, and East Waterfront, plus Under Armour’s campus, NGK-Locke, Inc.’s facility, and West Waterfront Park. 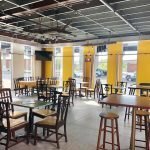 West End: West End will take the place of West Covington and Swann Park. At West End, Sagamore envisions utilizing the space for office, residential, commodity retail, maker space, and parking uses. Each block will be slightly different in size and shape with the street grid focused on gateways out to the Middle Branch and the new 28-acre West Waterfront Park. Two existing properties, City Garage and Schuster Concrete, will remain and the buildings’ footprints will help shape new blocks of the development. Sagamore plans two new walking bridges in West End. This includes the redevelopment of the Spring Garden Bridge, which connects the area to Westport, and a gateway elevated pedestrian bridge rising above Hanover St. at Cromwell St.
Hanover Street: Major changes are planned for Hanover St. in Port Covington from McComas St. to Cromwell St. where it meets the Hanover Street Bridge. Much of Hanover St. in this area is an above-ground ramp and Sagamore intends to bring much of it back down to grade just past McComas St. The team also plans on adding large sidewalks to Hanover St. as well as a median, on-street parking, trees and new landscaping, and new east/west intersections that are safe for pedestrians and vehicles. Though Hanover St. will not have dedicated bicycle lanes, new parallel streets to the east and west of Hanover, including Black St., will include them. Along Hanover St., Sagamore plans to add office and retail buildings with continuous ground floor retail. Retail foot prints would be up to 14,000 sq. ft. Office buildings are planned for the northern and southern stretch of Hanover St. with residential buildings in between. Outside of on-street parking, all additional parking structures on Hanover St. will be below grade. Building heights will range from approximately 103 to 125 ft., lowering in height as the street moves south. 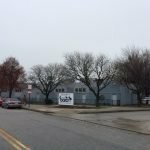 Cromwell Street: Sagamore plans to relocate The Baltimore Sun printing facility’s parking lots that face Cromwell St. so it can begin redevelopment. Between Hanover St. and W. Peninsula Dr., adjacent to Locke Insulators, Sagamore has larger footprints to work with and is hoping for ground-floor makerspaces, but noted that retail could be a use for these spaces in the future. The zoned building height cap is 135 ft. Between W. Peninsula Dr. and the bend in Cromwell St., Sagamore has plans for a park space called Urban Plaza. This will be a gathering area where many roads and paths from the Port Covington Master Plan converge. Urban Plaza will be three acres in size and Sagamore noted that future uses could include an ice rink or the site of a large Christmas tree. Just south of Urban Plaza will be a man-made lake at the northern point of Under Armour’s campus. East Waterfront: Along the water in East Waterfront will be East Waterfront Park, an eight-acre park which will include a ribbon path, archaeological pier, eco peninsula, boardwalk, piers, and water taxi stop. The park will surround Sagamore Spirit. Directly behind Sagamore Spirit to the north will be Penny Lane, a cluster of European-style, pedestrian-only blocks with smaller retail foot prints of 1,000 to 1,500 sq. ft. Several hotels could also go in East Watefront, including a potential high-rise on an existing pier at the Tidewater Yacht Service Club. All north-south streets in East Waterfront will have direct sight lines to the water, and bike lanes and pedestrian access will be a focal point throughout the area. On-street parking, as well as grade- and below-grade parking garages, is planned for the district. Most buildings in East Waterfront will have a height of 30 ft. to 60 ft. Founders Park: Founder’s Park will be highlighted by a large passive oval-shaped park that will also serve as traffic circle. Surrounding the park will be tall buildings, likely 300-plus ft. tall buildings to the north and 125 ft. tall buildings to the south. The buildings to the north will also face a redeveloped McComas St. which would be widened and include a light rail station, medians, and bike lanes. There will also be a bike and pedestrian bridge connecting McComas St. to Light St. in South Baltimore/Riverside. The bridge would go under I-95 and over the train tracks at a clearance of at least 23 ft. The buildings will have first-floor retail and offices or residential units above. 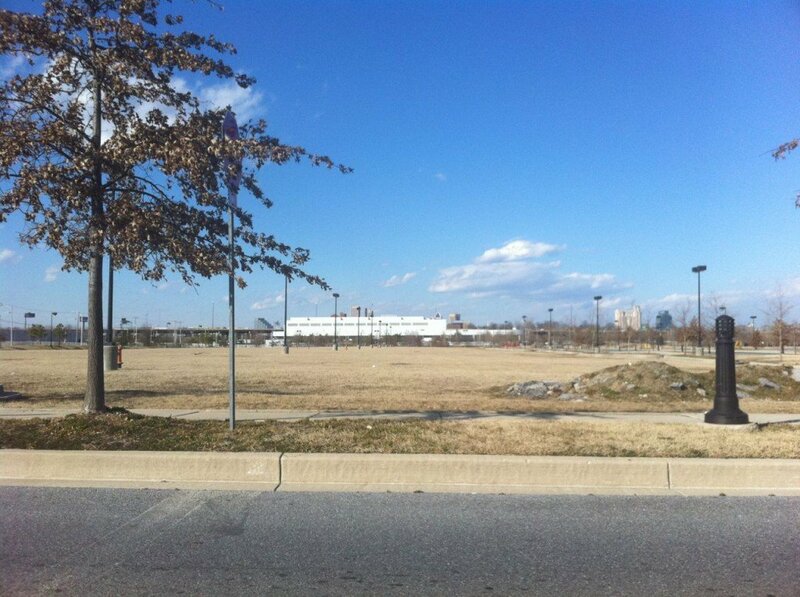 This area is expected to have the highest concentration of parking and residential units in Port Covington. 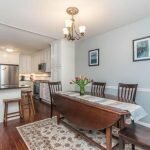 This area was described as more quiet with higher rates of home ownership. Founder’s Park will sit just east of the current The Baltimore Sun printing facility. Sagamore said it was in discussion with the company about reconfiguring the building in the future and providing adequate infrastructure to get its trucks in and out. East End: Just east of the Founder’s Park District is East End, which will also be highlighted by tall buildings to the north and smaller buildings to the south. East End is directly north of the proposed East Waterfront Entertainment District. Under Armour’s new campus will take the place of the former Port Covington Shopping Center. The overall 50-acre site will become a campus and global world headquarter for Under Armour. The project is led by Neil Jurgens, vice president of corporate real estate at Under Armour, as well as the design team of Bohlin Cywinski Jackson, BuroHappold Engineering, Nelson Byrd Woltz, STV, and Biohabitats. Whiting Turner will be the construction manager. It will include 4 million sq. ft. of campus buildings, 5,000 parking spaces, and room for up to 10,000 employees. The company has plans for four additional stages of development as it transitions from Locust Point to Port Covington. The next phase will begin next year. Under Amour’s Master Plan includes the future demolition of the now-vacant Walmart building, which was recently painted, to make room for office buildings and a sports stadium. The field will have a football, soccer, and lacrosse alignment with a surrounding running track. Under Armour originally planned for the stadium to have a capacity of 5,000, but noted that it keeps growing and could go up to 12,000 (for comparison, Towson University’s Johnny Unitas Stadium has a capacity of 11,198). The stadium will be open to the public during certain events. Looking to recreate an estuary that once existed at Port Covington, Under Armour will be creating a lake on the northern end of its campus in Phase I. 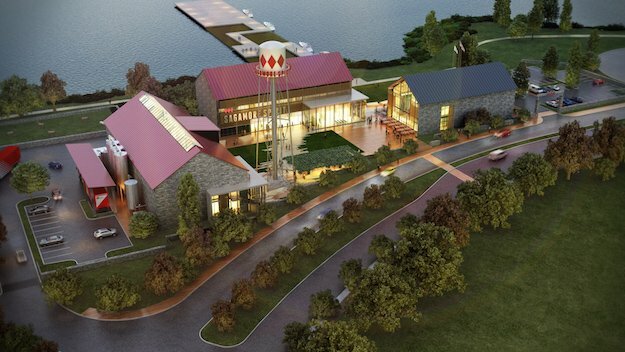 The lake will be filtered and also push filtered water back into the Patapsco River. Water from the river will also be used as part of a cooling technology for the buildings and portions of the water will run throughout the campus as part of a storm water management plan. 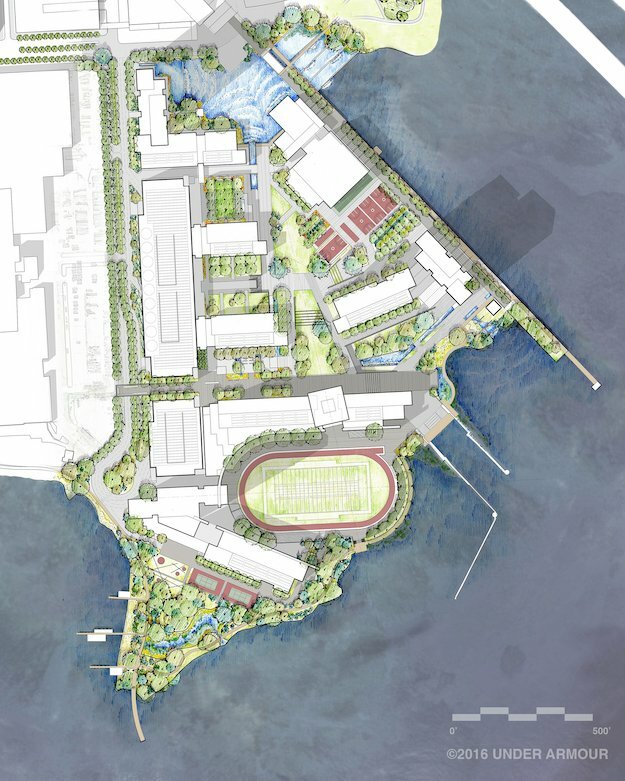 Along with the new stadium, Under Armour has plans for a public waterfront promenade, which includes additional fishing piers, a lake, and a future renovation of Ferry Bar Park. Under Armour is also planning a field house, similar to an athletic complex at many universities. It will feature an indoor practice facility as well as basketball courts and training equipment. 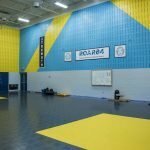 Local community athletic groups will be invited to use this space for workouts and events. 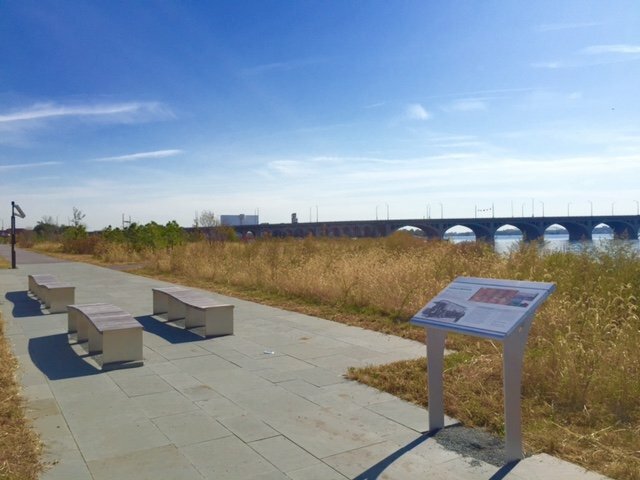 Port Covington will have more than 40 acres of parks including Founder’s Park, the Urban Plaza, and several small parks throughout. The space underneath I-95 along McComas St. is envisioned as an “urban playground” used as an “incentive to come further into the development.” Recreation facilities, such as basketball courts and skate parks, are proposed for this area. The two largest parks will be West and East Waterfront Park. West Waterfront Park: This will be a large expansion of West Covington Park and will feature 28 acres of space along the Middle Branch adjacent to West End. Sagamore has announced a partnership with Ripken Baseball in collaboration with Baltimore City Recreation and Parks to design athletic fields at this park. 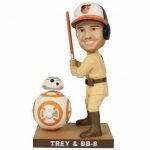 Ripken Baseball is a sports entertainment company that represents the business interests of Cal Ripken, Jr. and Bill Ripken. Ripken Baseball has helped design state-of-the-art fields across the United States, including multi-field Ripken Experience complexes in Myrtle Beach, SC; Pigeon Forge, TN; and Aberdeen, MD. Sagamore plans on blending the new street grid in West End and West Waterfront Park with several elevated pedestrian perches that look out on the park spaces. The new Spring Garden Bridge will connect the park to Westport. 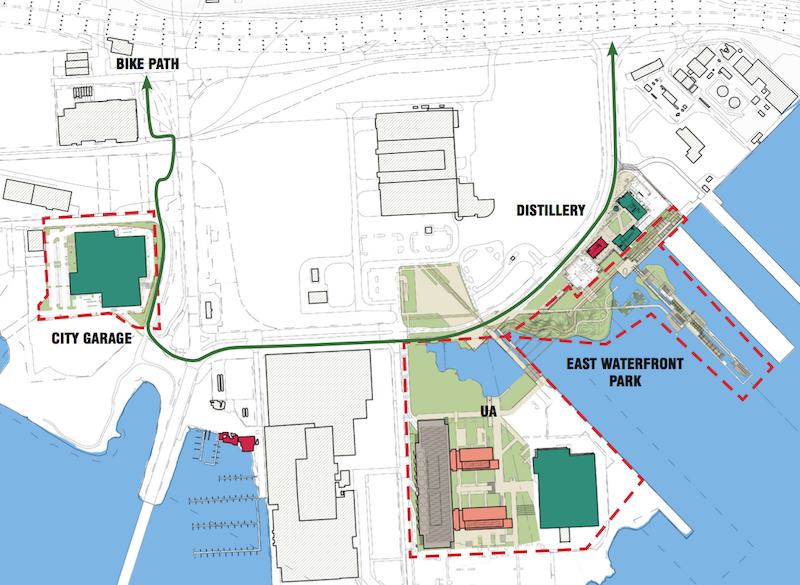 East Waterfront Park: The park will surround Sagamore Spirit in East Waterfront along the Patapsco River. The eight-acre park will have several sections and a ribbon path running through the entire park. A natural peninsula on the western end of the park will be called the eco peninsula. The peninsula will be used as a walkway and outdoor classroom with a living shoreline where they are hoping to create fish nursery structures. An existing archaeological pier will be rebuilt; however it will keep the original concrete structure with the addition of newer more stable surfaces surrounding it. The team is proposing a water taxi stop on the pier and oyster infrastructure along the water. There will also be a floating bridge connecting the pier and the eco peninsula. The eastern section is called Linear Park. This area has the least amount of depth off the water. A boardwalk will run along an existing concrete bulk head as well as the ribbon path set back further off the water. The team noted they are hoping to improve the ecology in this section through ideas such as floating wetlands. 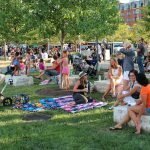 Portions of the park are already under construction and Sagamore Development President Marc Weller told SouthBMore.com the first priority is giving the public access to the park from E. Cromwell St. Port Covington will include many new paths for biking, running, and walking, whether as a means for commuting or exercising. 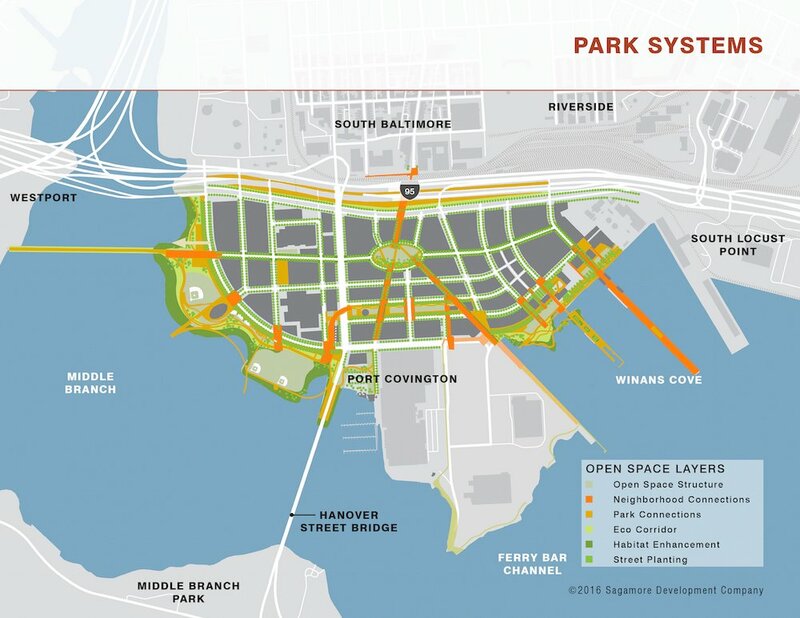 Port Covington has more than two miles of waterfront and promenades and paths at East and West Waterfront Parks and around Under Amour will allow visitors to tour all of it. 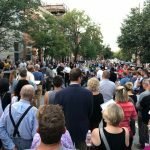 The development will have widened sidewalks and bike lanes through every district, as well as pedestrian-only streets. The rebuilt Spring Garden Bridge, connecting West Waterfront Park to Westport, was previously part of the 2007 Middle Branch Master Plan, which calls for a five-plus mile pedestrian loop, as well as the City Bike Master Plan. The loop would also travel along a 43-acre waterfront parcel in Westport that Sagamore owns but has not yet revealed plans for, existing Middle Branch Park, and the Hanover Street Bridge. Sagamore supports these master plans. 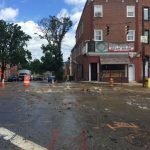 The Baltimore City Department of Transportation (DOT) also recently launched a $1.8 million study in partnership with the U.S. Department of Transportation through a TIGER grant to research improvements to Hanover St. and the Hanover Street Bridge from Wells St. in South Baltimore to Reedbird Ave. in Cherry Hill. A new 14 ft. wide cycling and pedestrian bridge will connect the 1900 block of Light St. in South Baltimore and Riverside to a new street called Violet in Port Covington. This bridge, which Sagamore’s transportation team described as fairly long and well lit, would go over the CSX tracks and under I-95. 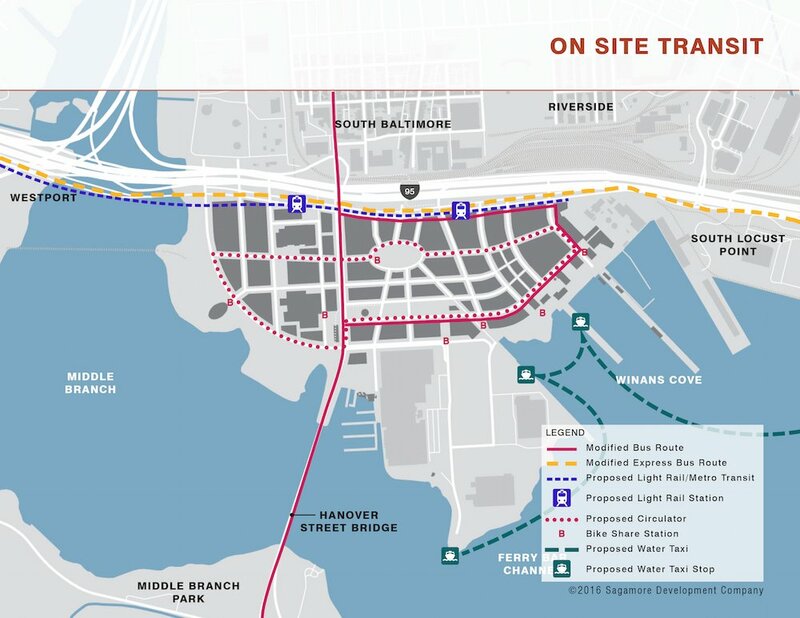 The bridge would meet in Port Covington at a new proposed light rail stop (a spur off the Westport station) and transition into a new continuous cycling lane. For transportation and infrastructure, Sagamore is planning a light rail spur along McComas St. from Westport with three new stops; redevelopment of Hanover St., McComas St., and Cromwell St.; I-95 on-ramp and off-ramp modifications; bike share stations; three water taxi stops; and a site circulator that could be rail or bus. Sagamore is planning the entire development with environmental sensitivity in mind and is hoping to get people out of their cars. Most of the parking at the development will be centralized closer to I-95 so that people walk through the neighborhood and towards the waterfront. It is looking to achieve a transportation modal split of 50% private motor vehicles and 50% walking, biking, and transit. 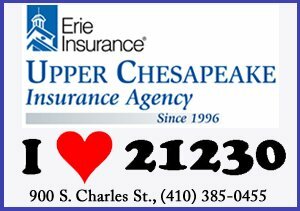 A study conducted by the team revealed that motor vehicles currently have a 74% share in Baltimore City. In its current state, drivers on I-95 North who plan to enter the peninsula neighborhoods at S. Hanover St. must either get off on the S. Hanover St. exit and make a U-turn at Cromwell St. or take the Key Hwy. exit and U-turn back onto S. Hanover St. Sagamore is proposing a new exit off of I-395 that would take drivers to Hanover St. and allow for a left turn going north and a right turn going south. Drivers on I-95 North would go on I-395 before taking this exit. The S. Hanover St. exit off I-95 North would be eliminated. The team said that new signage would be added directing drivers to Port Covington along this exit. All changes would be recommendations to the Federal Transit Authority which will conduct its own study with a public comment period. 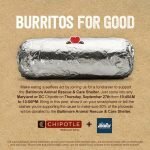 Regarding I-95 South, the Key Hwy. exit would be widened. Two lanes would access a redeveloped McComas St. which would lead drivers to S. Hanover St. and new Port Covington streets. A single lane would remain for direct access to Key Hwy. 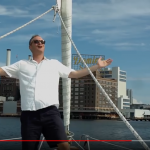 Plank’s Sagamore Ventures has acquired Harbor Boating, Inc., which provides water taxi services in Baltimore, and plans to build new, “environmentally and operationally state-of-the-art boats” in Baltimore. The contract includes additional routes, extended commuter hours, and an increase in the number of stops from the current 12 to 21 beginning in the 2017 season. Along with new stops in Port Covington, a stop is planned for Cherry Hill. To pay for infrastructure, parks, and ecology improvements in Port Covington, Sagamore is spending $327,780,988 of its own money on infrastructure and will receive $534,795,000 in TIF from Baltimore City. Under Armour, however, has pledged to not use any TIF proceeds for the infrastructure at its campus. Sagamore is also hoping to use those bonds to seek matching funds from state and federal sources in the amount of $573,683,000. The total infrastructure investment at the project would be $1,436,234,988. A TIF is a bond issued to Baltimore City or any other jurisdiction that is leveraged and backed by a real estate development. TIFs use the increased property tax revenues at the development to pay off the bonds. 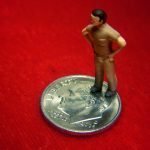 When the bonds are paid off, all property tax revenues go to the city coffers, but the current property tax revenues at the current rates continue to go to the city. Sagamore would be paying the same 2.24% property tax rate on all of its properties and on its future assessments, but much of those funds will go to the bonds to pay for the infrastructure. 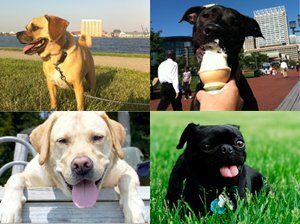 Baltimore City would own the newly-built infrastructure and parks once they are completed. To note, TIF bonds cannot be used for other projects and initiatives around the city, they must be used by the project that backs them. With the $534,795,000 TIF bond being a loan that has interest, it is expected to cost $1,424,515,451 over a 41-year period. In the event incremental property taxes are not sufficient to pay principal and interest on the TIF bonds, Sagamore would pay a “special tax” from the city. 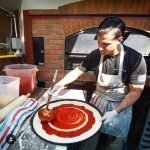 Port Covington currently has a tax assessment base of real estate value of $72,766,300 that provides the city with $1,635,786 in property tax revenues each year. At full build-out the base is expected to be $2,536,134,406 with an expected yearly property tax revenue of $57,012,301. The report projects Port Covington to increase its population by 12,073 residents with the large majority being residents of rental units. 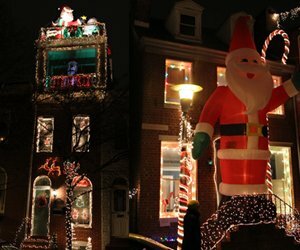 Along with increased property tax revenues, the proposal is projecting increases in income to Baltimore City through personal property tax revenues, hotel occupancy tax revenues, energy tax revenues, personal income tax revenues for residents and employees, and real estate transfer tax and recordation tax revenues. At full build-out, Sagamore is projecting $40,338,430 in yearly net fiscal impact to Baltimore City. The TIF investments for the city are estimated as a rate of return of 10.3%. With the record amount of public financing requested for this project, there was much discussion in the city about the deal with some groups questioning its fairness. 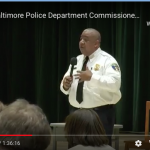 While the TIF request moved through the Baltimore City Planning Commission, a spirited debate took place at public hearings at Baltimore City Council Taxation, Financing and Economic Committee as they reviewed the deal. More than 10 hours of pubic testimony took place at several public hearings. 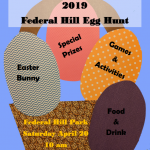 The project and TIF had strong support from groups such as Maryland Washington Minority Contractors Association, Downtown Partnership of Baltimore, the Baltimore Development Corporation, and the SB6, a coalition of Cherry Hill, Westport, Mt. Winans, Lakeland, Brooklyn, and Curtis Bay – the six South Baltimore neighborhoods south of the Middle Branch. Issues raised by groups such as Baltimoreans United in Leadership Development (BUILD), Port3, Build UP Baltimore and local labor unions included the amount of affordable housing required in the plan, local hiring requirements, “prevailing wages,” and the TIF’s impact on Baltimore City Schools’ funding from the State of Maryland. Some of the groups negotiated with Sagamore and a previous Memorandum of Understanding (MOU) was replaced with a new one. A key aspect of the new MOU is an increase in affordable housing at Port Covington. The previous MOU stated a goal of 10% affordable housing however, if affordable housing units could not be constructed on a financially reasonable basis at Port Covington, Sagamore would make a payment to the Inclusionary Housing Offset Fund. Now Sagamore must provide income-restricted residential units equal to 20% of all residential units at Port Covington, which could reach 14,000. 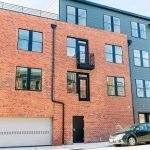 At least 60% of these affordable units must be provided on-site, while the balance may be developed off-site to address affordable housing needs in other Baltimore City neighborhoods. 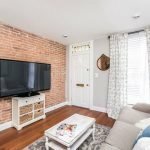 At least 10% of the units must be available to tenants at or below 30% of Area Median Income (“AMI”) and other units will be at 50% and 80% AMI. In summary, at least 12% of housing units built at Port Covington must be affordable. 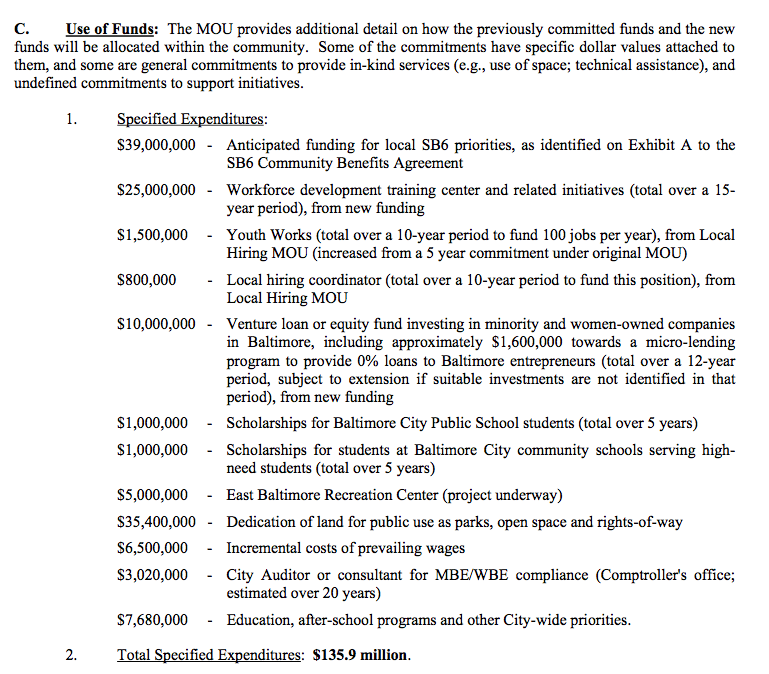 The MOU includes $139.5 million in funding commitments from Sagamore including a $39,000,000 community benefits agreement with the SB6; $25 million in new workforce development initiatives; $10 million for venture loan and equity in early-stage, minority, and women-owned companies in Baltimore; $35.4 million in acquisition costs of land to be dedicated for public use as parks, open space, and rights-of-way, based on current layout and expenditures for property acquisitions to date; a $6.5 million impact on commitment to prevailing wages; and a $10 million commitment to funding city-wide programs. See specifics in the graphic below. Approximately $20 million of this benefits agreement is projected to be paid out in the first five years following TIF authorization, several million of which will be paid immediately following authorization and before any profits are realized. 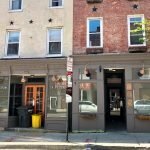 In regards to local hiring, Sagamore has agreed to a mandate that 30% of all on-site infrastructure work will be performed by Baltimore City residents. Also, Sagamore has agreed it will work to exceed a goal of 30% permanent job hours performed by City residents. As mentioned above, the TIF’s impact on Baltimore City Schools’ funding from the State of Maryland had also been a point of contention. The more wealth a jurisdiction appears to have, the less state funding it receives through the current formula. Sagamore has made an enforceable commitment in the MOU not to request issuance of any TIF bonds if there is a projected negative impact on State education funding for Baltimore City Schools, unless there is a clear plan in place to mitigate the projected negative impact. 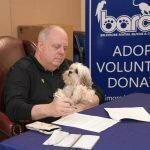 There is currently a three-year fix that was passed in the Maryland General Assembly. The plan for Port Covington also received a letter of support from the South Baltimore Neighborhood Association, the closest neighborhood to the project. The TIF bills were unanimously approved last month by the Baltimore City Council and signed into law by Mayor Stephanie Rawlings-Blake. “We are currently in the City Council with a PUD amendment that will enable UA’s first phase of its campus. Later this fall, we will begin the subdivision process. Following that, we will complete infrastructure design for the first new streets on the east side of Hanover Street. Sagamore will be underway with our first TIF-eligible projects by the end of the year, and shovels are already in the ground at the location of the East Waterfront Park. 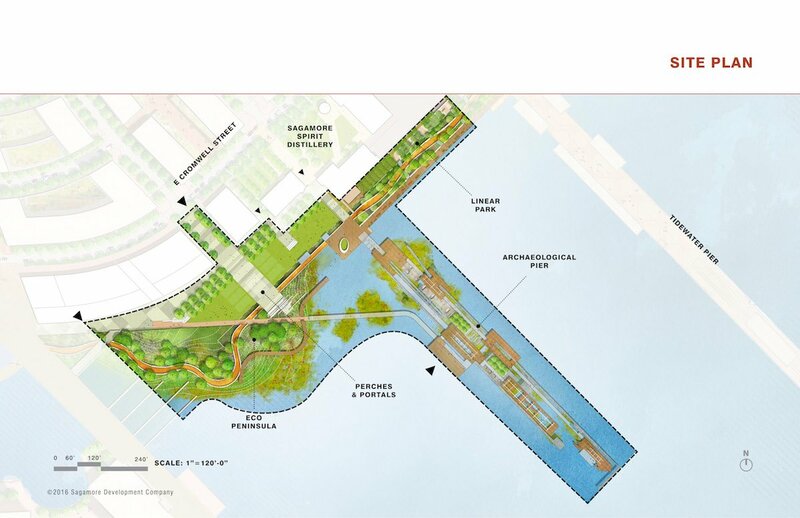 Initial efforts will concentrate on E. Cromwell Street and the proximate public spaces in order to provide public access to the waterfront and contribute to the ecological uplift of the Middle Branch. 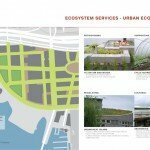 The path has been set for a lot of changes in Port Covington and SouthBMore.com will continue to document it as it begins to move full speed ahead. All renderings in this article unless noted otherwise are courtesy of Sagamore Development.